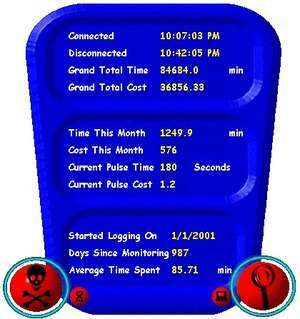 Internet Usage Monitor Free is an award winning tool developed in 2001. It monitors the time spent on the internet and calculates the cost according to the local telephone charges as specified by the user. Internet Usage Monitor is designed to work only with dial-up modems. The software has been downloaded by thousands of internet users and has been published in the following newspapers and magazines worldwide. Version 8 is a freeware program which does not have restrictions and it's free so it doesn't cost anything. For security reasons, you should also check out the Internet Usage Monitor Free download at LO4D.com which includes virus and malware tests. Additional screenshots of this application download may be available, too. Internet Usage Monitor Lite has a presence on social networks.